In 1916, the Austrian-Hungarian double monarchy, composed of many peoples speaking many different languages, had been in decline for a long time. The only symbol that still united it was, in fact, its “double monarch”, Franz Joseph I, Emperor of Austria and King of Hungary. When he died in 1916, after an incredibly long reign that started in the revolutionary year of 1848, the last vestiges of unity disappeared from the nation and it was to no-one’s surprise that when World War I ended in an Allied victory, Austria-Hungary disintegrated into states that more or less mirrored their ethnic composition. 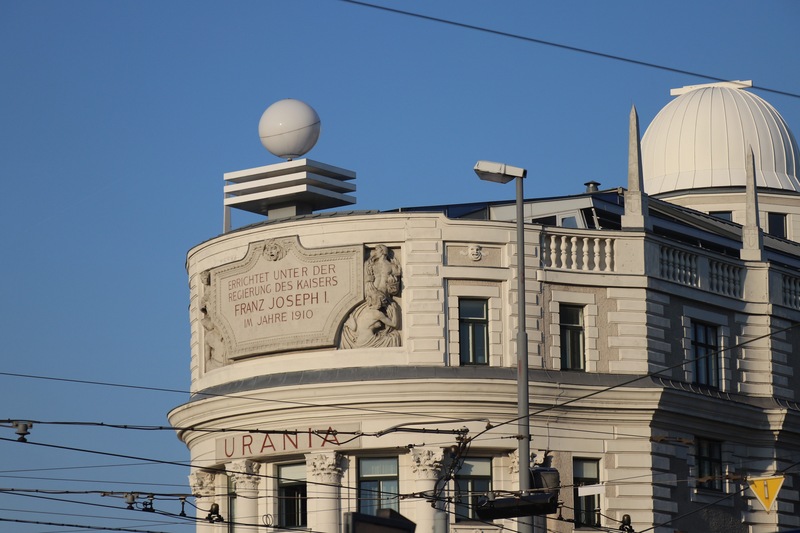 Urania, an observatory in art-nouveau style, opened by FJ in 1910. 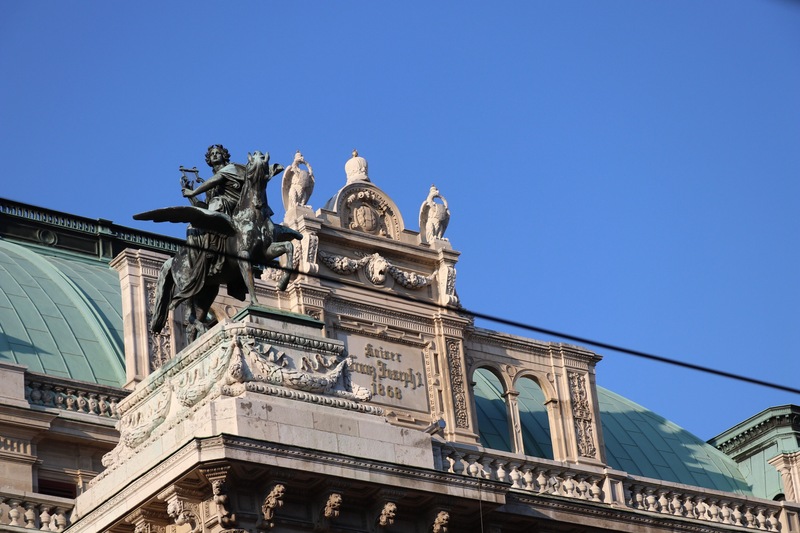 The famous Vienna Staatsoper, on the Ring, also bears an inscription honouring the “Eternal Emperor”. 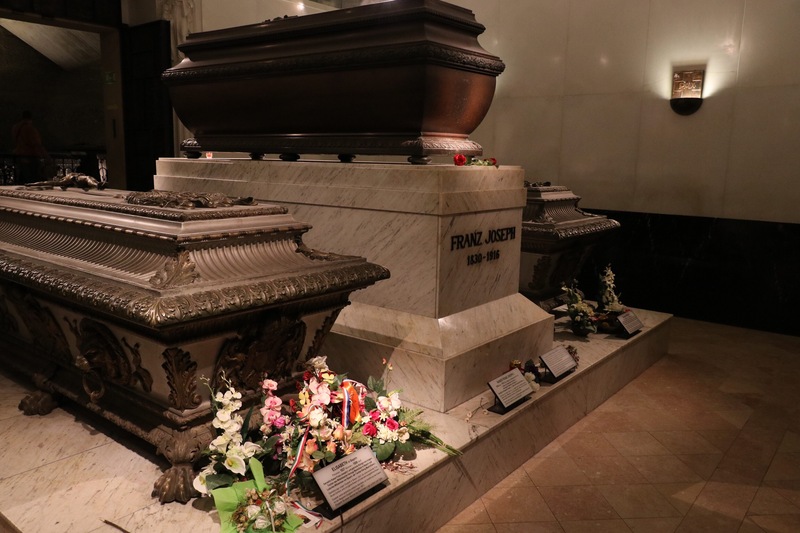 But in Austria, and especially in Vienna, you might be forgiven for thinking that Emperor Franz Joseph, and his incredibly popular consort Empress Elisabeth, better know as Sissi, passed away only recently. 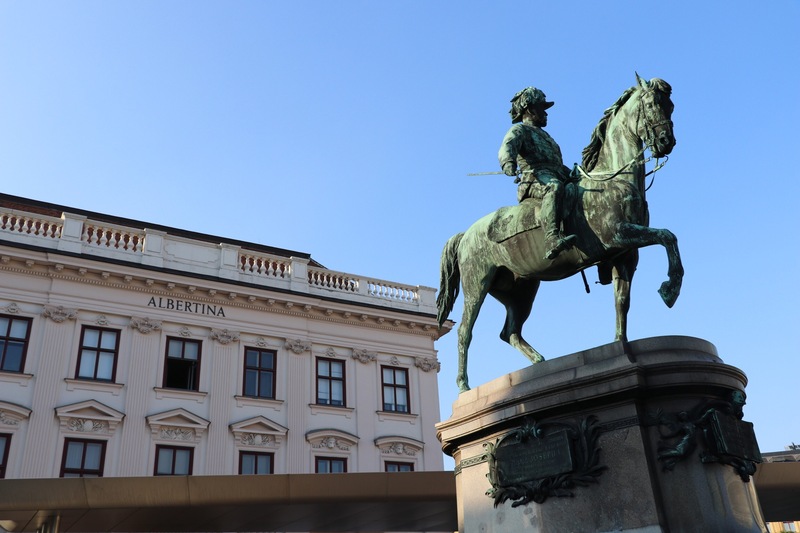 There are inscriptions in his memory everywhere, his statues dot the city’s avenues and Kaisersgeburtstag, “the Emperor’s Birthday” (August 18th) is still a thing. 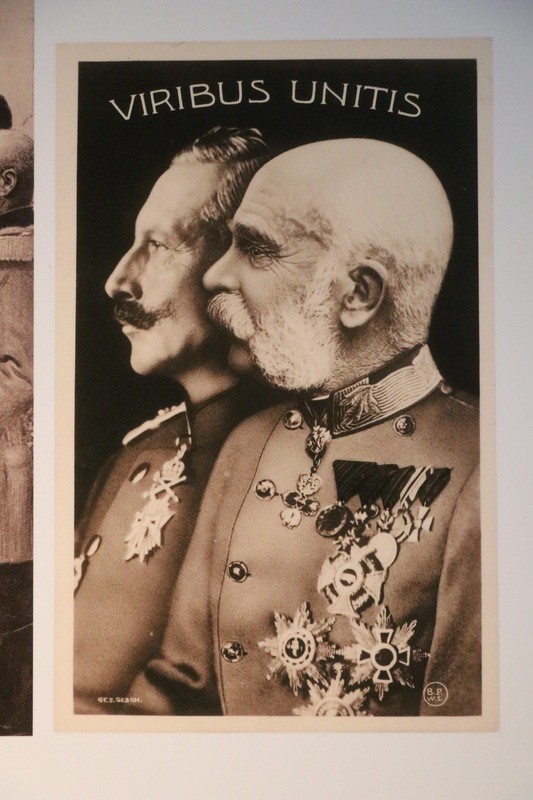 To draw a rough comparison – his German and British more-or-less contemporaries, Kaiser Wilhelm II and Queen Victoria, are definitely not as fondly and widely remembered as old Franz Joseph. Emperors Franz Joseph I and Wilhelm II, shortly before WW I. By this time, FJ’s motto ‘With joined forces’ was taken to allude to the strong bond between Germany and Austra-Hungary. His likeness, with the martial moustache, was famous already during his reign (he widely used portraiture and later photography in an effort to spread some kind of presence through his vast empire) and is still instantly recognizable today. The popularity of the long-dead Imperial couple shows from the fresh flowers that are often found at Empress Elisabeth’s tomb in the Imperial Burial Vaults. 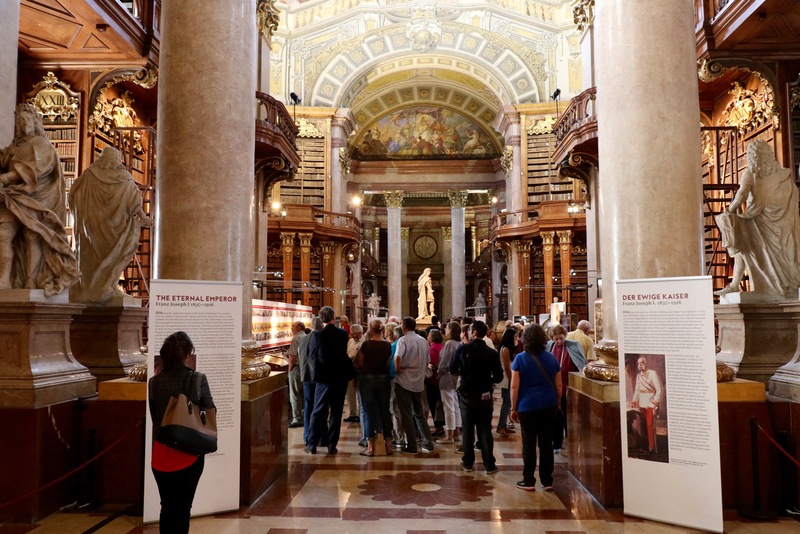 This Kaiser’s Birthday, in the year that is also the 100th anniversary of his death, I happened to be in Vienna and visited the Kaisergruft (Imperial burial vault), and an exhibition at the Austrian National Library called ‘the Eternal Emperor’ (der ewige Kaiser). As you can imagine, for the Dead Emperor’s Society, things can’t get much better! A temporary exhibition at one of my favourite Berlin museums, the Gemäldegalerie, introduced me to the Spanish Golden Age. The phrase “Siglo de Oro” didn’t ring any bells, even though as a Dutch history buff I know all about the Golden Age – the one in Holland, of course, not the Spanish one. It turns out that both countries’ Golden Ages coincided, both covering the late 1500s until the late 1600s. Interestingly, during most of these two countries’ Golden Ages, they were actually fighting an (at times) bloody war: in the Eighty Years’ War (1568-1648), the Protestant Northern Netherlands, under the aegis of the Orange-Nassau dynasty that still rules today, sought to gain independence from Roman Catholic Habsburg Spain. Another parallel between the Dutch and the Spanish Golden Ages is how they manifested themselves in painting. The Dutch Gouden Eeuw gave us the works of Rembrandt and Vermeer, the Spanish Siglo de Oro Velásquez and El Greco, to name a few important representatives. Here are some pictures that shed some light on the religious and political conflict between north and south, Protestant and Catholic, and republic and monarchy. 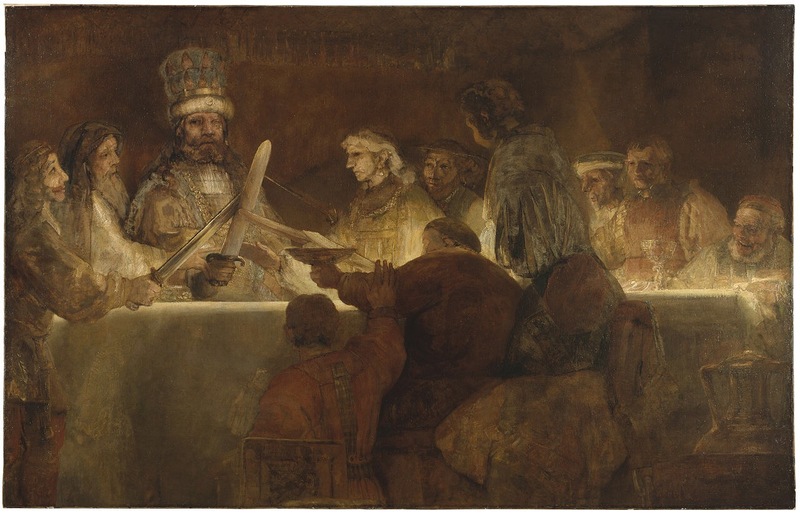 The Rembrandt picture, originally even larger than The Night Watch but later cut down by the artist, shows Claudius Civilis, a Germanic fighter of the Batavian tribe, who lived on the lower Rhine. He led an uprising against the occupying Romans in 69 CE. It is, of course, an allegory of the Dutch revolt against the Spanish. 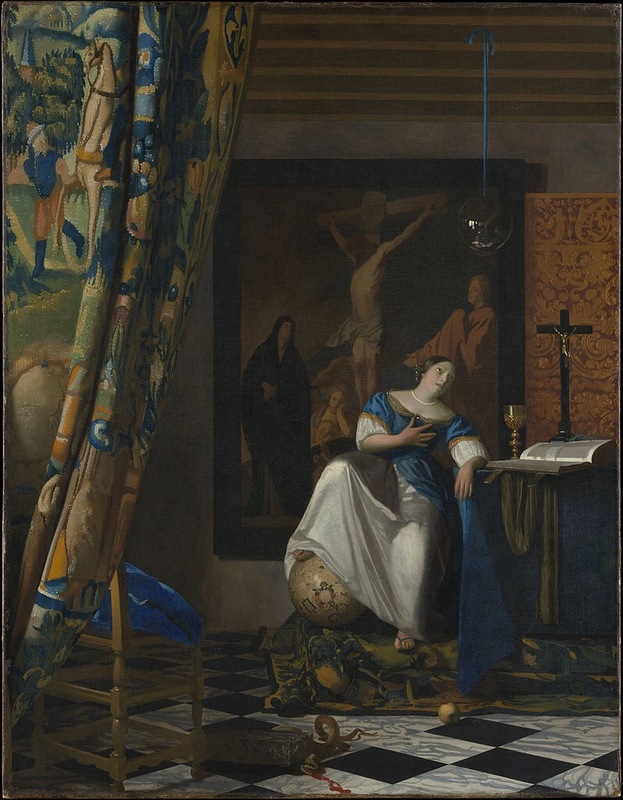 Vermeer, who converted to Catholicism upon marriage, spent the last years of his life living next door to a clandestine Jesuit church in Delft. His story reinforces the fact that the northern Netherlands, to this day, never became fully protestant, but that large groups of Roman Catholics remained. 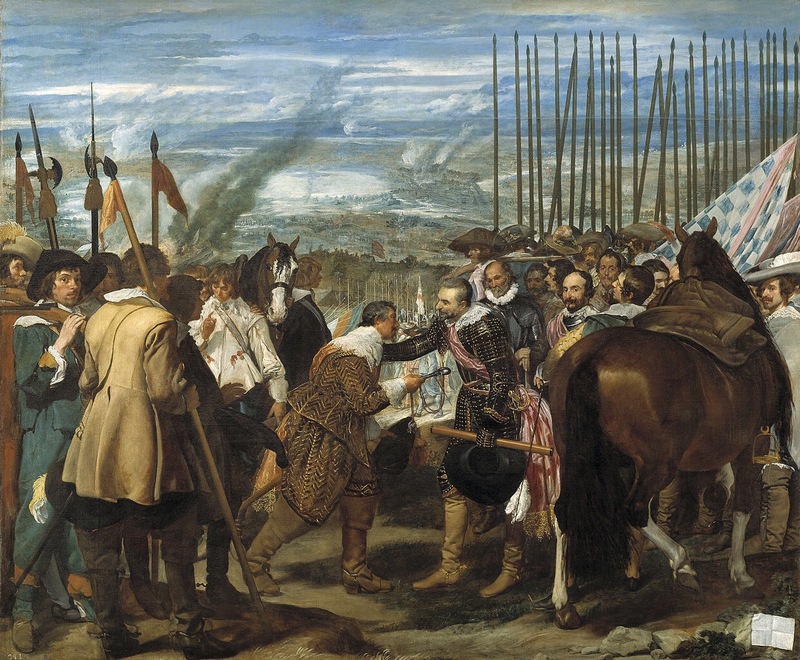 This picture, one of Velásquez’ most famous, shows one of Spain’s rare military victories in the second half of the Eighty Years’ War. General Spinola, a friend of the painter, conquered Breda, a frontier city between the Northern and Southern Netherlands and a Nassau stronghold, but is said to have shown mercy on the besieged. 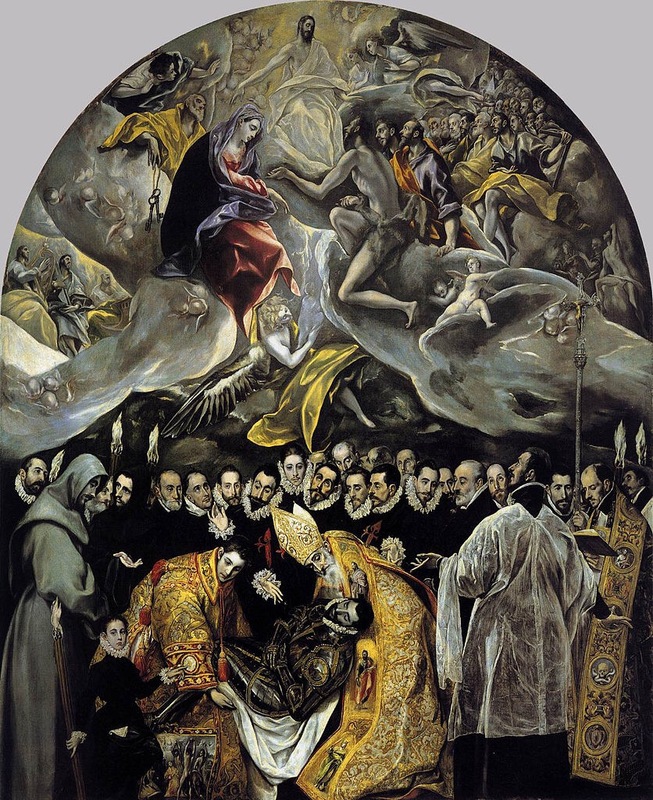 Finally, El Greco, “the Greek”, who may have carried Byzantine influences to his Toledo workshop, worked almost exclusively on church commissions and did not include political themes in his works. However, he was probably the catalyst that triggered the Spanish Golden Age of painting. 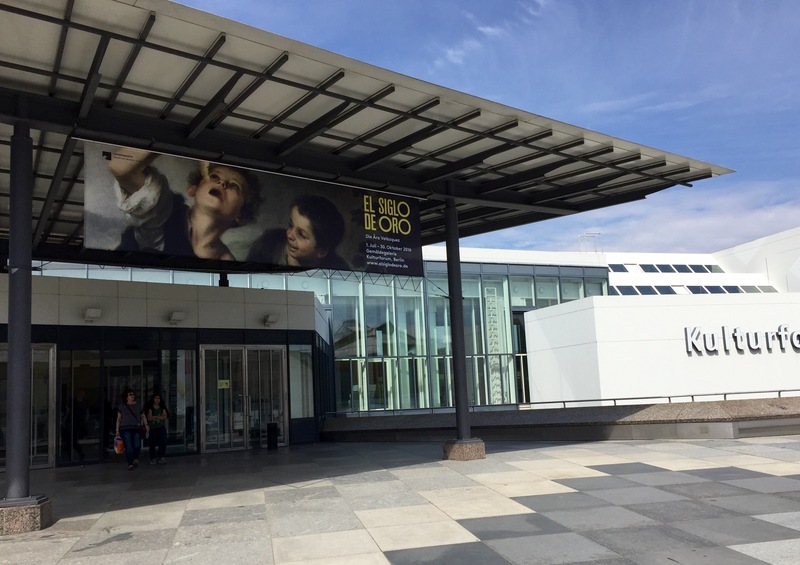 The Berlin exhibition, showing some famous masterpieces of the era, does give a fine impression of the importance of the arts in 17th century Spain. 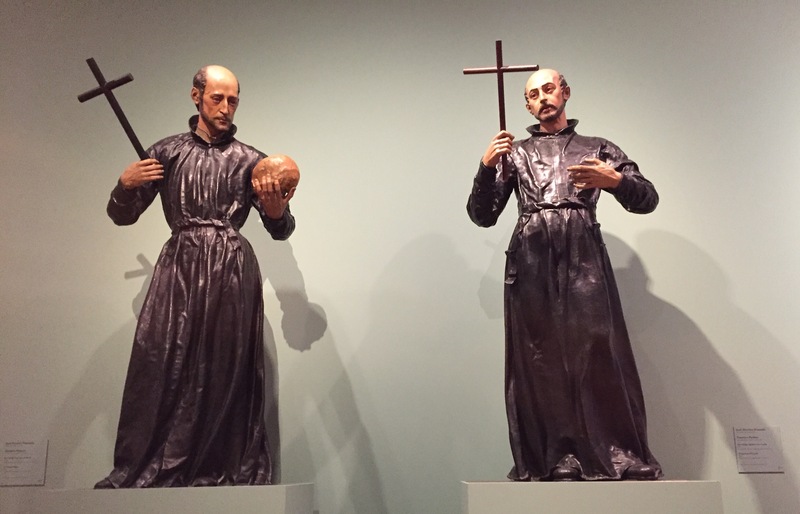 Many works, especially from Seville and Valencia, were commissioned by the Church, such as these statues of two Jesuits. They show Ignatius de Loyola and Francisco de Borja, first and third Superior General respectively of the famous and powerful religious order at the heart of the Counter Reformation. But my favourite picture must be “Mars resting”, created by Diego Velásquez while court painter to King Philip IV (1605-1665). Mars, the God of warfare, is shown in a rather despondent state. His weapons lie at his feet, and his drooping posture seems to say that he is weary of war. Would its assorted enemies, the Netherlands included, finally have gotten the better of Spain? Gemäldegalerie, Kulturforum Berlin, until 30 October 2016. Some 50 miles east of Berlin lies the Polish town of Cedynia. Since the 1960s, on every 24th of June it is the scene of a festival commemorating the Battle of Cedynia, which took place there in 972 CE. Reenactment aficionados replay the battle in mediaeval costumes, there are open air concerts, and blacksmiths and potters display their trades. The battle itself, then, took place over 1000 years ago, between the forces of German count Odo I and Polish warlord Mieszko. 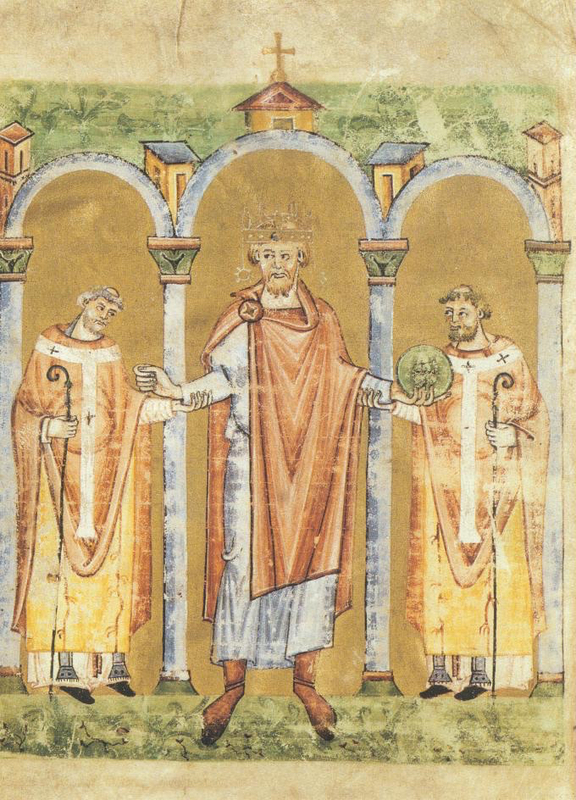 Odo was as a vassal of German emperor Otto I. His attack on Mieszko’s lands was against the wishes of the Kaiser, as Mieszko himself, the first documented ruler of Greater Poland, also paid tribute to the empire. Odo was unable to beat his Polish opponent and the battle ended in a truce. A year later, Otto, the old emperor, would lay down a judgement settling the matter, but the conflict was only fully resolved when Mieszko married a German noblewoman some seven years later. But why does this ancient and forgotten battle (at least until after World War Two) get so much attention now? The reason is Cedynia’s situation on the Oder river, part of the famous Oder-Neisse line. When Stalin demanded that Poland should be shifted westwards at the end of World War Two, this happened at the expense of German territories like the easternmost part of the Prussian province of Brandenburg. The town of Cedynia (which was called Zehden until 1945) became Poland’s most westerly city. All German-speaking citizens were deported from the area, and the town became the new home of refugees that Stalin had chased from the east of pre-war Poland. The Polish shift from East to West. The red line on the left is the Oder-Neisse line. The selection of the Oder-Neisse line as the new Polish-German frontier had a long diplomatic aftermath. The GDR accepted the new border as soon as 1950, but the Federal Republic (or West Germany) didn’t formally agree until 1970. The German reunification treaty of 1990 again acknowledged the border specifically, hoping to assuage Polish fears of German expansionism. So, in the 1950s and 60s, it is understandable that Poland’s communist regime was not quite certain of the status quo of its new western frontier. Politicians knew perfectly well that the area had been German for a long time, and the state did its best to justify its claims on the territory. Clearly they weren’t fully convinced that the atrocities inflicted upon Poland by the Nazis during the war were justification enough for some compensatory annexation. Model of Villa Wolf at Gubin, Poland. The terraces overlook the Neisse river, the post WW-II border between Poland and Germany. The model was created by students of Potsdam’s University of Applied Sciences. In the public entrance hall of Hans Scharoun’s Staatsbibliothek on Potsdamer Straße, there’s a temporary exhibition on a fantastic architectural project: the planned reconstruction of Ludwig Mies van der Rohe’s Villa Wolf in the now Polish town of Gubin. Mies (1886-1969) originally trained as a bricklayer, which shows in the extensive use of the material in his early designs. Villa Wolf, built in 1925/6, was Mies’ first modernist construction, and it is generally accepted to also be the first modernist building in the world. Bombed in World War II and never reconstructed, it is now one of those mythical places of architectural history – just like Mies’ famous Barcelona Pavillion. Created for 1929’s World Fair, Mies built the Pavillion as a showpiece of Germany’s newfound intellectual creativity after the suffocating historicismof the imperial era. It was disassembled after the show and vanished, and only photographs survived. When it was reconstructed in 1986, it drew massive attention. Berlin’s Kulturforum. From left to right: Mies’ Neue Nationalgalerie, Friedrich August Stüler’s St. Matthew’s church, and Hans Scharoun’s Philharmonie and Staatsbibliothek. Showing this exhibition at the State Library creates a nice juxtaposition with Ludwig Mies van der Rohe’s very last design, the Neue Nationalgalerie built in 1969. It sits just across the road from the library and also is part of the Kulturforum. Mies returned to Berlin from the United States, where he had moved in 1937 to escape the Nazis, one more time to finish this project, which can be considered as the architect’s reconciliation with Germany. Mies’ architectural drawings of the Villa Berg have been preserved at the New York MoMA. And that’s exactly how the sponsors of the new Villa Wolf at Gubin see the project – as a reconciliation between Germany and Poland. As was the case in Frankfurt and Görlitz, two other towns on the Oder-Neisse border, the new border created in 1945 split Gubin and Guben (on the German bank of the river) in two. But when the building is completed, it will be a monument for one of Germany’s most famous architects, sitting on the Polish side of the river but overlooking Germany. Construction is planned to start in 2017 and the rebuilt villa will serve as museum for Mies van der Rohe’s work. The exhibition at the State Library has now ended, but more information on the villa’s resurrection project can be found at www.villawolfgubin.eu. On a recent drive from Berlin to the Netherlands I found myself on an 80 km arrow-straight stretch of two lane highway next to a shipping canal. There was nothing much to see for the whole distance. A few farmhouses, a junction with traffic lights and a bridge across the canal every 10 km or so, and one town, Esterwegen, where there’s another traffic light. But at Esterwegen, there were two road signs, Esterwegen Memorial and Esterwegen Cemetery, printed in the font Germany reserves for Official Places of Significance. I’d never heard of either, and the signs also didn’t say what the memorials were for, but with a sense of foreboding and curious as to what might be so important in the middle of nowhere, I followed the signs. Walking from the impeccably maintained (and empty) parking lot to the memorial itself, I soon found out from the displays that Esterwegen was the Nazi concentration camp most famously associated with the song of the Peat Bog Soldiers – or Die Moorsoldaten in German, a tune I’ve known for years. Here is the short version of the lyrics, in German and English. Wohin auch das Auge blicket. 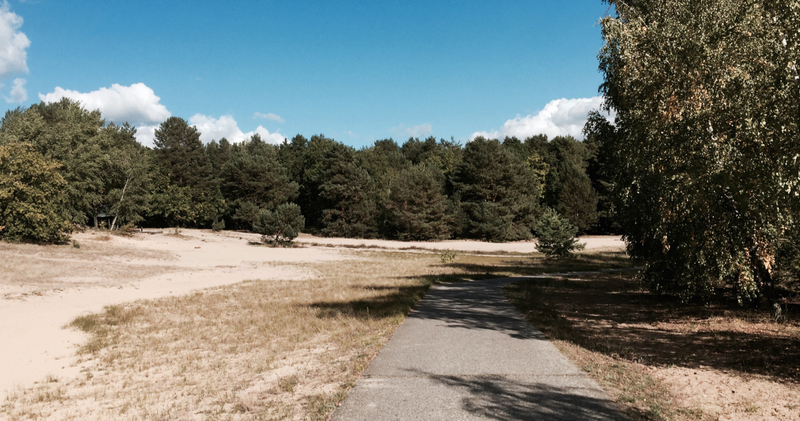 Moor und Heide nur ringsum. Eichen stehen kahl und krumm. und ziehen mit dem Spaten ins Moor. vierfach ist umzäunt die Burg. Heimat du bist wieder mein. nicht mehr mit dem Spaten ins Moor. Heath and bog are everywhere. Not a bird sings out to cheer us. Oaks are standing gaunt and bare. Marching with our spades to the moor. No one, no one can get through. Guns and barbed wire block our view. One day we shall rise rejoicing. Homeland, dear, you’re mine at last. Will march with our spades to the moor. Here’s a version sung by American folk music hero Pete Seeger, performed in 1967 at the East Berlin Oktoberklub folk club (that’s another interesting story! ), in German as well as in English. The buildings of the memorial look like what you’d find on any industrial estate, but once inside I found myself in a stark museum-like space. I later found out that the memorial for Esterwegen Concentration Camp has only been created as recently as 2011 – when the Bundeswehr (German army) vacated the site. Hence the industrial look – the buildings originally were military barracks. Inside, there’s an exhibition that again drives home the chilling message of the horrors of nazism. This part of the current state of Lower Saxony has always been dirt poor, with very bad soil and no industry to speak of. During the depression of the 1930s, the Weimar government had already started New Deal-like employment projects in the area, using the unemployed’s cheap labour to dig peat and reclaim farm land from the marshy soil. A display of the names of the other Peat Bog concentration camps at Esterwegen. Bergermoor is where the famous song was written. As soon as the Nazis came to power in 1933, they started using the existing workers’ camps as prisons for their political enemies. These were mainly socialists and communists, but also liberals and centrals – anyone who would speak up against the regime. One of the very earliest concentration camps, the inmates were not treated quite as inhumanely as at the destruction camps the Nazis later built further east, but deaths among prisoners were frequent and the treatment of the inmates was completely at the mercy of the fascist prison guards. Many took personal revenge on political prisoners from their old home towns. Postcard sold at the memorial – one of the song’s earliest versions. But the prisoners were granted one favour – on Saturday nights, they were allowed to organise entertainment, ghoulishly calling themselves the Zirkus Konzentrazani (a play on the many travelling circuses of those days with Italian sounding names). This is where the famous Peat Bog Soldier song was first performed – as early as August 1933, when the Nazis had been in power for just over six months! It soon became known outside the camp and even became a battle hymn of sorts for the Republicans fighting Franco’s forces in Spain from 1936 onwards. Ironically, even the prison guards liked the song – they possibly also viewed themselves as Peat Bog Soldiers, being stuck in the middle of nowhere with their charges. What keeps surprising me when looking at the exemplary German culture of remembrance as it exists today (with memorials for the murdered Jews, homosexuals, and Sinti and Roma all within a stone’s throw from Brandenburg Gate, the country’s most cherished symbol, and television programmes about the horrors of World War II almost every night), is that much of it is relatively recent. The memorial at Esterwegen was only created in 2006, when the Bundeswehr saw fit to leave the site. The House of the Wannsee Conference was only turned into a memorial in the 1990s, when the building was released by the city of Berlin from its former use as a children’s home. And many of these memorials would not even exist if it hadn’t been for ‘citizens initiatives’ that collected the necessary signatures. It just goes to show how much time is needed for any nation to truly come to terms with the negatives in its past – usually until all active participants in the era concerned have either died or at least are old enough to have lost their political influence. Speaking of political influence: at 2016’s annual holocaust memorial ceremony on 27 January in the Bundestag, the German parliament, this beautiful version of the Peat Bog Soldiers was sung (in German of course) by RIAS Kammerchor, one of my favourite classical choirs. Which version do you prefer? Pete Seeger’s emotional song accompanied on the banjo performed at a GDR state sponsored concert, or the mathematical precision of the arrangement by RIAS Kammerchor in the heart of modern German democracy, the Bundestag? Let me know in the comments! From April to October Tuesday to Sunday, 10 a.m. to 6 p.m.
From November to March Tuesday to Sunday, 10 a.m. to 5 p.m.
Kaiser Wilhelm II finally tried for WW I war crimes – acquitted on four out of five counts. Although much of the last decade’s historical writing is more nuanced (see especially Christopher Clark’s Kaiser Wilhelm II and Sleepwalkers), most people in the English speaking world still consider Kaiser Bill the main actor in starting World War I. During his lifetime the Kaiser was never put in the dock for his alleged war crimes. To make up for that omission and also to shed more light on the ‘whodunnit’ question, a team of Dutch historians and lawyers staged a moot trial of Emperor Wilhelm II for war crimes. They’ve worked on the project for eight years but today, the book documenting the trial was presented at Amerongen Castle – Wilhelm’s first place of refuge after coming to the Netherlands on 10 November 1918. For the trial, the team used the five allegations against the Kaiser that were documented in 1919’s Versailles Treaty. Article 229 specified that the Allies would request the government of The Netherlands, where Wilhelm had been granted political asylum, to extradite the ex-Kaiser. He would then stand trial in a court consisting of an American, a British, a French, an Italian and a Japanese judge. In the end, the trial never took place. The Netherlands refused to surrender the Kaiser, and by the early 1920s, the Allies’ focus changed to different matters, such as making sure Germany would stick to the Versailles Treaty’s other measures. The trial team, consisting of international and criminal law experts and historians, tried to create the kind of trial that Wilhelm could have expected if the Allies had had their way. For this, they studied international law as it was current in the 1910s and 1920s. The Kaiser is considered responsible for the violation of international law and the use of war. In an interview with Dutch broadcaster NOS, Hans Andriessen, who led the project and also took on the role of Kaiser Wilhelm II’s trial lawyer, explained his trial tactics. Much like the ex-Yugoslav leaders and generals who were tried at The Hague over the last fifteen years, he first tried to deny the court’s jurisdiction over the Kaiser: at the last minute, the Allies had snuck in many unfavourable clauses into the Versailles Treaty, which the Germans had had no choice but to accept. This duress, Mr. Andriessen argued, rendered the whole Treaty void. This argument was rejected, but Mr. Andriessen was surprised that the other parts of his defence, as judged by contemporary international law, were largely accepted. On the first count, the Kaiser was acquitted, as starting a war, at the time, was a deplorable but legitimate course of action for nation states that considered themselves threatened. Wilhelm was found guilty on the second count. Andriessen’s repeat of his defence that Germany had felt threatened by the enemies surrounding it to such an extent that its only option was to invade Belgium (and attack France) was considered not plausible. On count three, the Kaiser again was acquitted as no direct link between his command and the atrocities could be established. Interestingly, count four, total U-Boat war, also led to acquittal. Andriessen’s successful defence was that the British had started arming their merchant vessels even before the start of WWI. This made it unsafe for German submarines to surface and establish whether ships were carrying passengers or not. Having given sufficient warning of its rules of engagement, the German navy, and its supreme commander, could not solely be blamed for the course of the U-Boot war. (The same argument, Andriessen points out, was also successfully used by Admiral Dönitz at the Nuremberg trials after World War II). The fifth count was struck out by the court as it was considered too vague. This meant the Kaiser was found guilty on only one of the five counts, and a sentence was passed that excluded him from public office and confined him to house arrest for the rest of his life – probably not coincidentally exactly what happened to the Kaiser anyway. He spent the rest of his life on an estate in the Dutch village of Doorn, chopping wood to keep fit and holding court for those who still wanted to visit him. He died there in 1941 and lies buried in a small mausoleum in the grounds. For more information on the book, for example check amazon.de. The interview with Mr. Andriessen by NOS can be found here. ssew.nl is the home page of the Dutch Society for the Study of World War I, which sponsored the moot trial. Visit huisdoorn.nl to learn more about the Kaiser’s last refuge in the Netherlands, now a museum documenting his life in exile and providing information on World War I.
Google please note: Potsdam’s Mercure hotel is *not* getting torn down! In newspaper articles, Michael Bauer, the manager of Potsdam city centre’s Mercure hotel, has complained that Google and the city council are killing his business. By continuously floating plans to have the hotel torn down (for which the council neither has the money, nor the necessary majority), the first thing that travellers find when they google the hotel, apart from the usual booking engines, is lots of links about its imminent demolition. Which isn’t good for business. So where does the political controversy come from? Of course, any planning initiative in Germany can count on a, let’s say, lively public debate. Especially where ex-GDR architecture is concerned. Let’s take a look at the Mercure’s surroundings. “Ceci n’est pas un château” – this is not a castle (but, indeed, a modern reconstruction housing the State Parliament). Polytechnic (and church dome) behind. The city centre of Potsdam, Berlin’s smaller neighbour but the capital of the Land of Brandenburg nonetheless, is a curious mix of spectacular original classicist, fake baroque, and authentic brutalist GDR architecture. Potsdam’s Nikolaikirche, by Karl Friedrich Schinkel, seen from the Stadtschloss. First, and the most original, is Karl Friedrich Schinkel’s Nikolaikirche (1837) – which looks new but isn’t (at least not completely). Heavily damaged, like most of central Potsdam, in April 1945, it was first restored in the GDR era, and then again in 2010. Hence the bright sandstone colour, which combined with the giant copper-green dome mean that the church is visible from miles away. Second is the Landtag – or State Parliament. It’s a reconstruction (completed in 2014) of Potsdam’s former City Palace – the Potsdam winter residence of the Hohenzollern kings. Exactly like its counterpart Stadtschloss in Berlin, it was heavily damaged in the last stages of the Second World War, and then torn down by the communist regime. Also like Berlin’s city palace, it was reconstructed to the outside looks of the old palace, but with a modern interior. On weekdays, you can walk in to see the businesslike insides – and even have lunch in the parliamentary canteen. Third, authentic GDR architecture. A prime example in the centre is the Fachhochschule, which rubs shoulders with both parliament and church. Fachhochschule, Stadtschloss and Nikolaikirche. Between the buildings you can make out the 18th century obelisk and behind that, the Old City Hall. The ramshackle building is one more obstacle to the plans of the city council (and the Land government) to recreate the classical look of Potsdam’s city centre. Last news is that it will be torn down in 2017. Not because the building itself is considered to be ugly (probably a sop to the “Ewiggestrigen”, GDR nostalgists) but simply “because it is in the wrong place”. View from the Mercure Hotel towards Potsdam’s old city centre. The Mercure, a 17-story Plattenbau prefab building, was built as an Interhotel on direct orders of then GDR president Walter Ulbricht, to represent the ‘socialist crown of the city’. It opened in 1969 and also has its Berlin counterpart – the current Park Inn at Alexanderplatz (which was completed in 1970, also as an Interhotel). The hotel was completely refurbished after the fall of the Wall in 1989 and today is pleasant enough – certainly on the inside, where some corridors have a wonderful view of the new Landtag and the Nikolaikirche. If you ask nicely at reception, you can take a lift up to one of the hotel floors and take some pictures. Meanwhile, the discussion about the hotel’s future continues. Prominent Potsdam residents, such as fashionista Wolfgang Joop and talkshow host Günter Jauch, have been running a campaign for its demise. Plans to replace it range from an art gallery (since withdrawn) to a recreation of the former Lustgarten (palace park) that used to occupy the site. But, as stated above, objections are fierce. There’s the large representation of ex-communists on the city council, who view the hotel’s demolition as another affront to the GDR’s cultural heritage (to which one prominent Potsdamer answered: “It’s nothing to do with the GDR. Anyone can see it’s just ugly”). But there are also financial reasons why an attempt for the city to acquire and destroy the hotel could end in tears. Buying and demolishing it could cost some 15 million Euros, and the city would lose its only large central hotel – leading to a loss of tourist income. And, finally, there’s the hotel manager, who has just signed another ten year franchise deal with the Mercure chain, and assures anyone who wants to hear that he intends to fully complete the course. How utterly exhaustive a mediaeval itinerant king’s life must have been (and how blessed we motoring tourists are today) is shown by this map of the travels that Emperor Henry II undertook throughout his territory in 1017 alone. Emperor Henry II’s 1017 itinerary. From: Ehlers, C. (ed. ), Mitteralterliche Königspfalzen (Göttingen 2002). Kings and emperors travelled their realms from palace to palace until the late Middle Ages, accompanied by the whole court. They did this to confirm their authority over the local rulers governing in their names, to rule as judges, show themselves to the people and gain legitimacy, to meet the lords of the realm, often to wage war but also simply because agriculture in those days did not produce enough surplus to feed a large and demanding court in one place for too long. As we can see, Henry started his itinerary in the mountainous Harz region in middle Germany. We have more detailed information on some parts of his trip than for others as much of the data comes from the chronicle of Thietmar, the Abbot of Merseburg, who probably recorded the nights spent in his own vicinity (eastern Saxony and the Harz) more precisely than those in other parts of Germany. Moving away from the Harz area, Henry travelled southwest to Ingelheim and Mainz, where he celebrated Easter. After that, the Emperor sailed down the river Rhine and visited an important meeting with the grandees of the realm. He subsequently made his way East, back to the Harz mountains, following the ancient royal road known as the Westphalia Hellweg. On the way, Henry attended Pentecost celebrations at the Werden monastery near Essen. The large distances the Emperor travelled towards Ingelheim (in Spring) and Frankfurt (in December) show that royal attendance to important feasts like Easter and Christmas was planned long in advance. Towns and abbeys vied with each other to have the monarch spend important religious festivals at their location. Emperor Henry spent the summer, as was often the case, waging war. In the year 1017 he campaigned against Poland – unsuccessfully. The campaign is indicated on the map in dotted lines – but doesn’t show the full extent of the army’s eastwards travels. 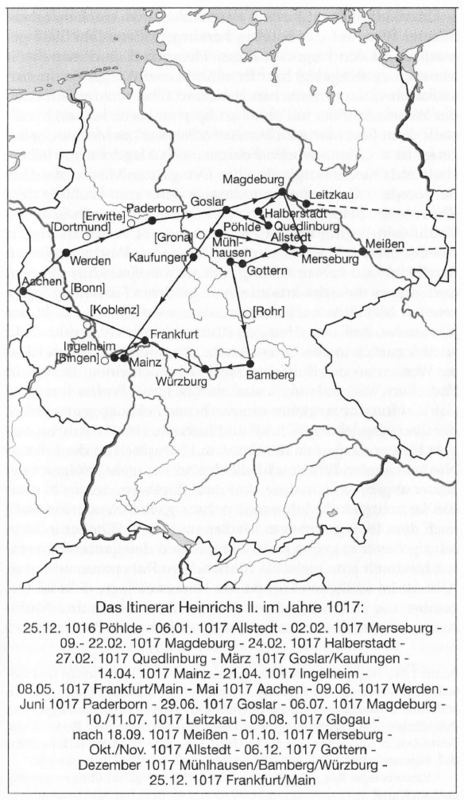 Returning from Poland, the Emperor again visited Saxony and the Harz, and then started on a southwestern tack towards Frankfurt for Christmas, with a wide diversion via Bamberg and Würzburg. All together, Henry and his court would have travelled a minimum of 2600 km in this year. Estimating daily progress at 25 km, this means over a hundred days spent in the saddle. Despite the fact that historians have been able to reconstruct royal itineraries for most individual years of the early German imperial era (usually based on royal charters from archives, which were always signed with a date and place), it is often not quite clear why the court chose a specific itinerary and places of lodging. Possibly palaces and abbeys were selected based on available dwellings, a good relationship with a host, such as an abbot, available food stores, or just the personal preference of the Emperor. An important factor was also whether the palace was part of the royal domain, thus belonging to the King himself, or was the property of some other authority. The importance and prestige of a palace could be judged by the number of visits paid by the monarch over the years, and, as we’ve seen, the religious festivals attended there. Just as we do not really know why the court selected certain routes of travel, we are not sure why certain parts of the realm were skipped, sometimes for years on end. Were they too insecure for royal travel? Or was the King so sure of his authority in those places that he could afford to leave them unvisited? You may have noted that I use “King” and “Emperor” intermittently here. “King” would be proper, as the perambulating mode of government was part and parcel of being German King, whether the King would eventually be crowned Emperor or not. The palaces of the royal domain also fell to the King upon his election. But obviously “Imperial” has a ring of its own (explaining why German Kings went to such great lengths to get the Pope to crown them as Emperors), and many stopping places on the Emperor’s itinerary started calling themselves “Imperial Palaces” from an early date. Certainly repeat visits by Emperors lent a special appeal to such palace town. This, for example, explains why Henry III’s palace at Goslar, restored at the height of the 19th century mediaeval revival, is referred to as the “Kaiserpfalz” (imperial palace), not “Köningspfalz” (royal palace). What fascinates me about itinerant Kingship is how any man could be capable of sustaining this exhausting way of life, repeating this great journey throughout a very large empire year upon year, continuing to reconfirm their authority to their imperial grandees, while maintaining focus on governing the country as a whole. Of course, the fame and respect that the office of King or Emperor commanded would have helped, as would the fact that royal authority was very much based on ancient magical and sacred traditions, and most people were honoured by a royal visit. Just by following mediaeval Kings along their itinerary for a bit, driving along provincial roads from town to town, you start realising the mind-boggling tenacity these people must have had to up this rate of travel, on horse-back, in wind and weather. The modern traveller’s reward, as it may have been the ancient Emperor’s, is to discover yet another of Germany’s spots of beauty, whether it’s an ancient cathedral, a monastery or a royal palace, hidden in provincial towns that are insignificant today, but whose treasures bear witness to a culturally rich and diverse past. All along the Mauerweg, there are monuments for the poor souls who lost their lives trying to cross from East to West. Did you know that there’s a cycle path that follows the full length of the Berlin Wall? The most dramatic part of the Wall surely was the 40 km inner-city section that divided West and East Berlin. But a much longer stretch, 125 km long, ran around the whole of West Berlin, separating it from the surrounding GDR countryside. Apart from keeping GDR citizens from entering West Berlin, it also caused a kind of claustrophobia in many West-Berliners, who could not easily leave the city. 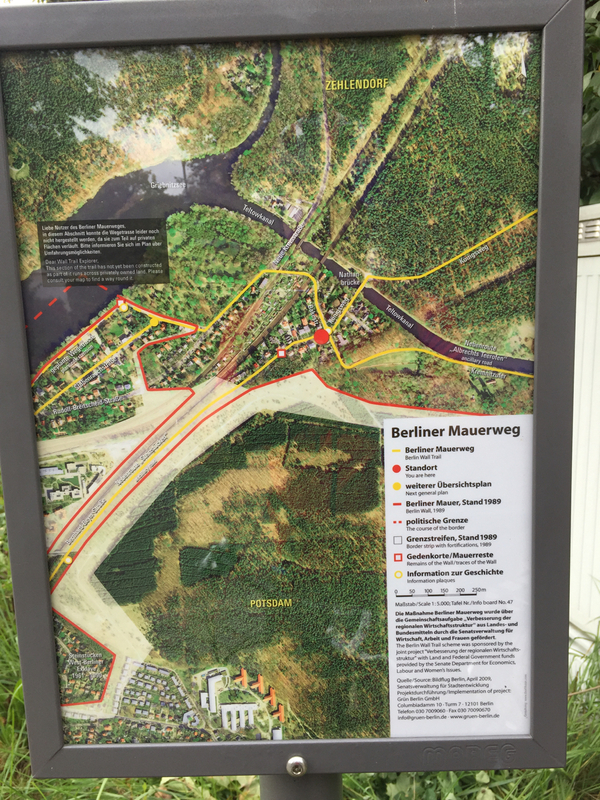 You can try to get some idea of what life was like outside and inside the Wall by taking the Berliner Mauerweg, or Wall Trail, a fully signposted cycle and hiking path that follows the course of where the wall used to be – all 165 kilometres of it. 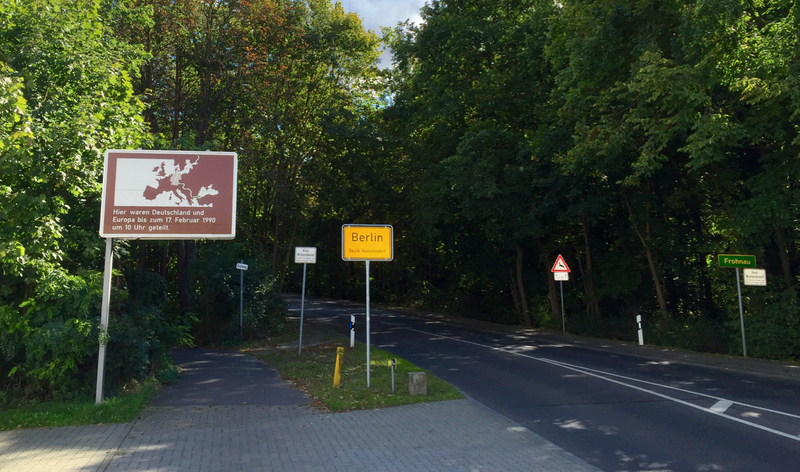 I cycled the path in two days in September 2015, starting at the former Chausseestrasse border crossing, continuing south through the city, and following the trace of the Wall clockwise. 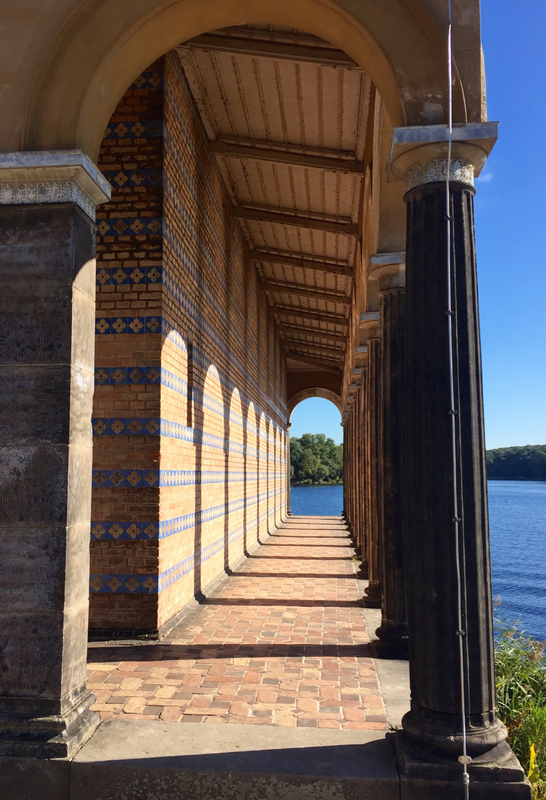 On the first day I cycled 72 km to Potsdam-Griebnitzsee, and took the S-Bahn back to Berlin-Mitte. On the second day, from the same S-Bahn station I continued clockwise for another 95 km back to Mitte. These signs are placed at most roads leading out of (west) Berlin. Each shows the exact date and time at which that particular border crossing opened. Cycling the Wall 25 years after German reunification is a strange experience. First of all, it’s astonishing how little there is left of it. There are information panels on the path that show aerial photos of what the border strip looked like in the 1980s – sandy wasteland, watchtowers, outer wall, inner wall… almost all of this has gone. On 125 km of Mauerweg outside the city, I’ve spotted two remaining watchtowers, and a few slabs of inner and outer wall – that’s it. (If you’re looking for that kind of thing, you might as well stick to the inner city). The no man’s land of the death strip is either overgrown, built up, or otherwise disguised. Again, there’s only a few places where it is immediately recognisable. Sign shown the original layout of the inner and outer walls and the death strip. What’s also strange is how hard it has become here to tell East from West. If you’ve been to Brandenburg towns outside Berlin (Oranienburg, for example), you probably agree that they still look very “GDR” in places. But on my clockwise run down the path that straddles the West-Berlin border, I had to keep reminding myself that “left is East” and “right is West”. The bits that run through nature of course look neutral. And in the parts where you ride through built-up areas, the houses on the eastern side are often just as nice (often because they’re newer) as the ones in the former West. Cherrypicking or the Full Monty? Obviously, doing the full Wall ride is satisfying in itself. The trouble is that if you want to do it justice, and also take some time for photography or reading the many explanatory signs, you’ll need three, maybe four, rather than just two days. So if you have limited time, or are not keen on two full days of cycling, or want to experience more of what you see en-route, I would recommend cherry picking some stretches. Here’s the two that I liked best: one is the inner city bit that many guided tours also follow (partially or fully): starting at Bornholmer Strasse crossing in Prenzlauer Berg, the first border crossing to open on the night of 9 November 1989, and continuing as far south as, let’s say, Treptower Park. In many S-Bahn stations (like here at Griebnitzsee), you have to carry your bike to the platform. As for the country part of the Mauerweg, my favorite part starts at Potsdam Griebnitzsee S-Bahn station, which is right on the Wall Trail, and can easily be reached from Mitte on S7 and S1. There’s a bike (and canoe!) rental place right at the station. Continue northward, and you’ll cross Glienicker Brücke (famous for its Cold War spy exchanges), and ride through the park of Cecilienhof Palace. It’s a great way to explore the UNESCO Potsdam Havel area. The path traces the Havel lakes, past the lovely Heilandskirche (Church of the Redeemer), and then there’s a long forest ride. 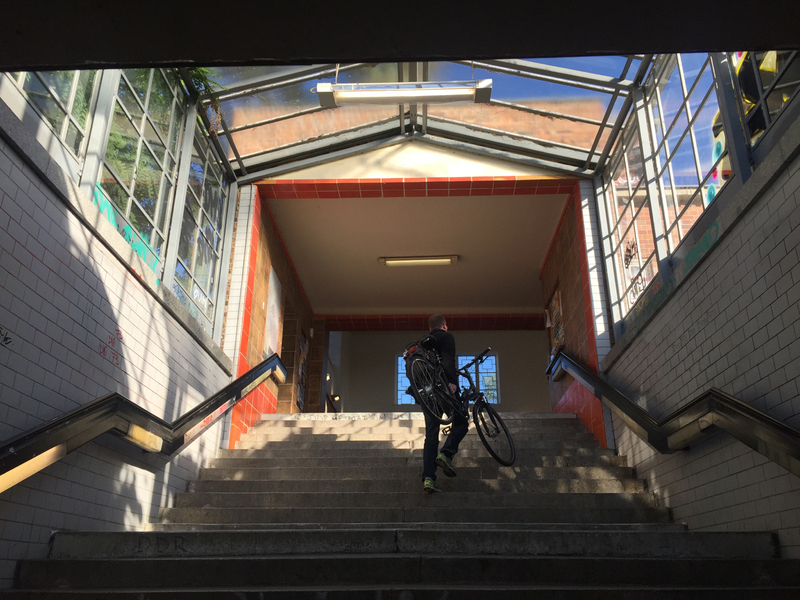 The first opportunity to put you and your bike back on a train to Mitte is at Berlin-Staaken railway station. The distance is roughly 35 km. Or you could turn around at the church and make your way back to the bike rental place at Griebnitzsee. Tree roots have caused the tarmac surface to break up, causing a bumpy ride. Some people say you need a mountainbike to ride the Mauerweg. That’s not strictly true, although if you have one, go for it. The thing is, the path is quite good (for a 165 km initiative), but not that good. 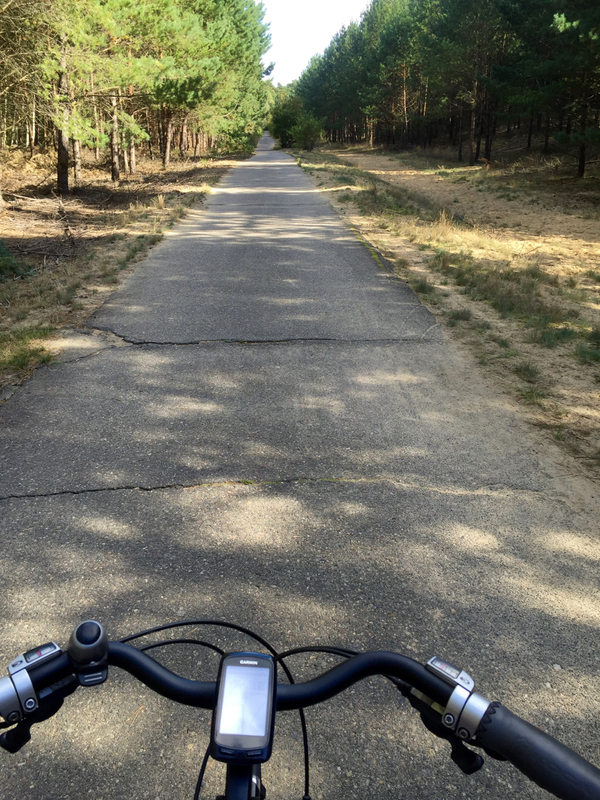 The tarmac, for example, is broken by tree roots in many places which makes for a very choppy ride. There’s stretches of gravel, which I like, some sand, which is OK depending on recent weather and your tyres, and a few kilometers of cobble stones, which are terrible. All of these problems are ok for short distances but if you want to complete the loop they can get very tiresome. The southern half is not very hilly, but I did about 400 metres of climbing on the northern section (mostly short, steep hills). So if you can get your hands on a bike that has front suspension (for the bumps) and gears (for the hills) that would be good. Unless you have the stamina of a Paris-Roubaix racer, road bikes (Rennrad in German) are not suitable, not to speak of fixies (but then, they’re not actually for riding, are they?) Obviously bring a tyre repair kit (Flickzeug, one of my favourite German words) as most of the time, it’s a heck of a long walk to the nearest S-Bahn station or bike shop. 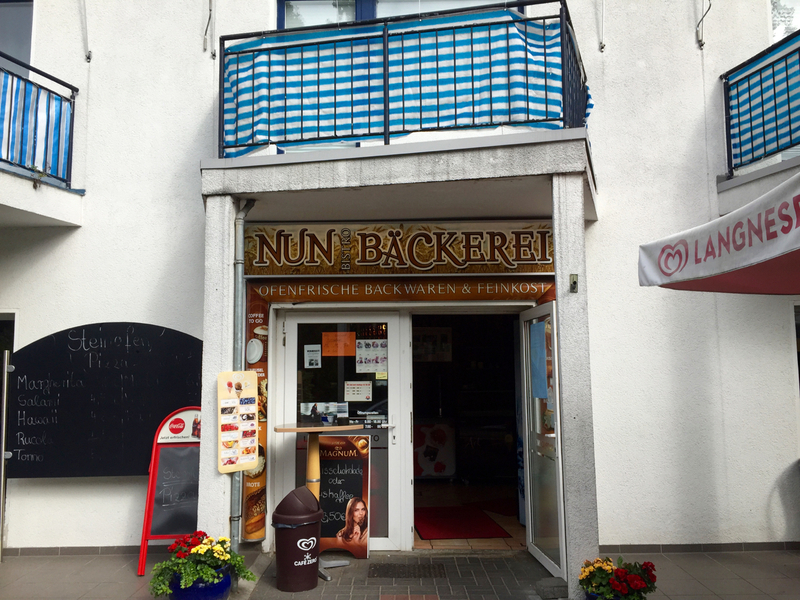 This little bakery in Zehlendorf was the first eatery I came across, 40 km after leaving Berlin at Treptow. Which brings us to food. My app says I used about 4000 calories for the whole ride (with a 20 km/h moving average, which is not that fast). That’s the equivalent of 40 bananas or 8 Big Macs, none of which you can buy on the trail. There are some shops and cafes here and there, but outside the city, there are many stretches where you can ride for 30-40 kms without getting to a food outlet. You could interrupt your ride and cycle into the city to find food, but it’s probably better to bring lots of fruit and sandwiches. The Mauerweg signs put up by the Berlin Senate. 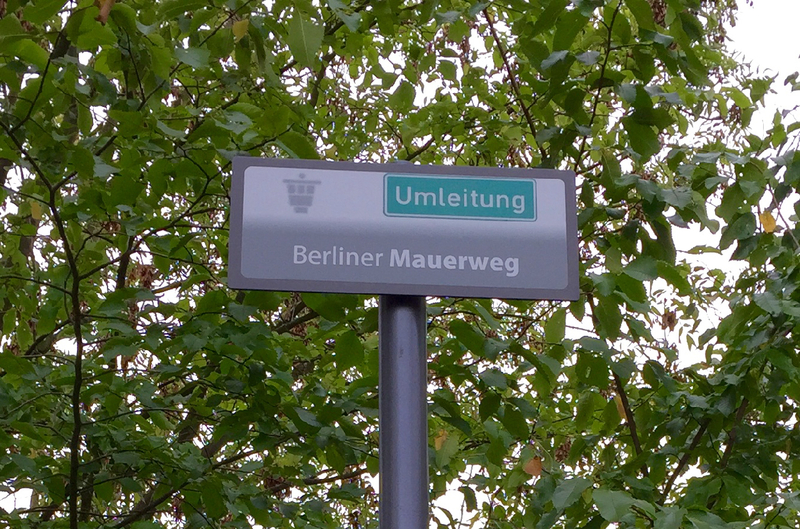 They even have official Umleitung (deviation) signs, bless them! To find my way around, I mainly just used the official signs. I also had a GPS on my handlebars, which was nice as a backup, and as a warning for upcoming turns. You can download my gps .gpx track here. A map is great for getting your bearings in the grander scale of things (the Mauerweg has so many twists and turns that it’s easy to get disoriented). The PublicPress map is cheap, durable, and, importantly, clearly shows S-Bahn stations, so you can always find your way back home. One side of the map shows the full Mauerweg, the other side shows an enlarged segment of the city centre. It’s also got some text explaining the sights along the way. Highly recommended. 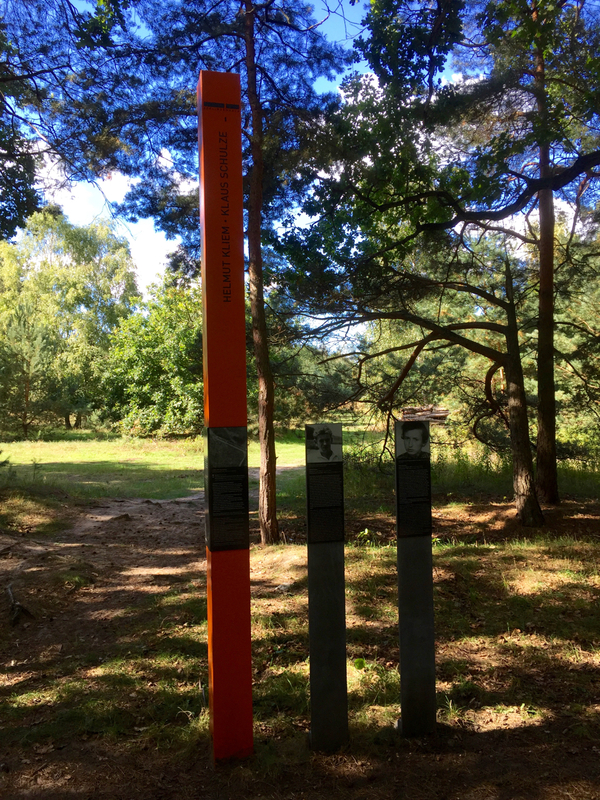 The Berlin Wall Trail near Hennigsdorf. One of the few places where the former death strip still looks original. So – the only thing left to do is actually do it. Stock up on food, pump up those tyres, and off you go. Just start riding, see how far you get (there’s plenty of S-Bahn stations in the first 20-30 kilometres to cut your ride short if you want to). There’s space in the comments for your experiences! 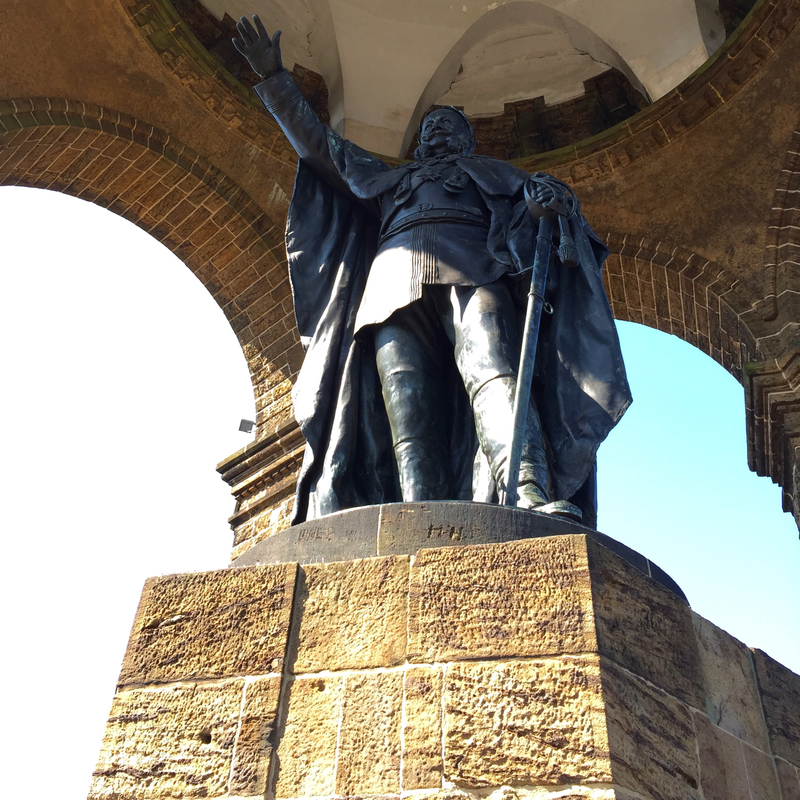 Kaiser Wilhelm Monument (1896) at Porta Westfalica. The Kaiser is shown as a triumphant Caesar, bearing a laurel wreath. Dotting Germany’s northern half, there is a collection of 19th century monuments that are astonishing both in size and theme. 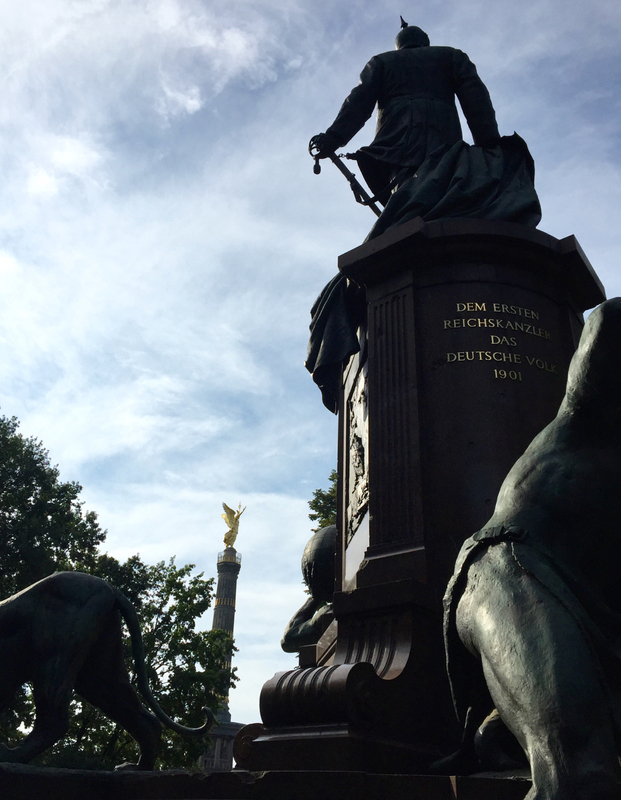 These huge memorials have various motifs: many are dedicated to Kaiser Wilhelm I and were built after his death in 1888. 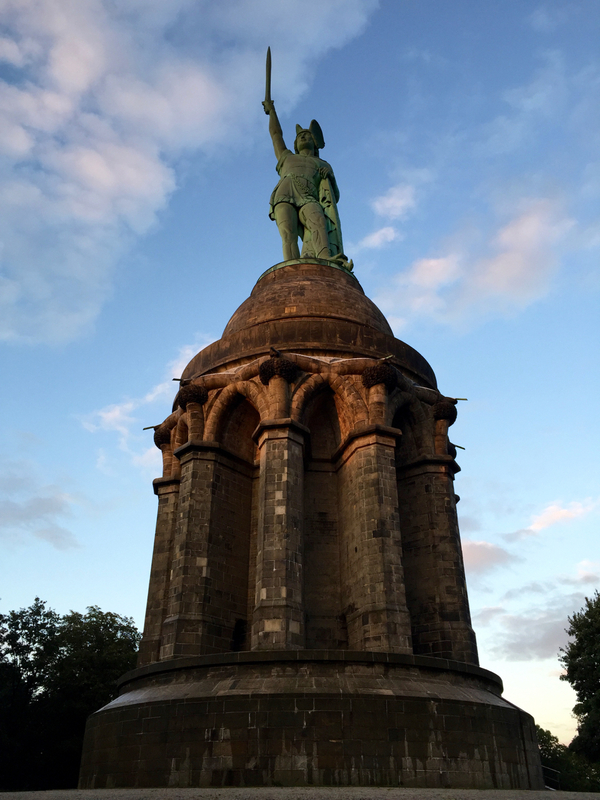 Others, like Berlin’s Victory Column, glorify battles as recent as the victory over the French in 1871, or as ancient as the Roman legions’ defeat by the Germanic tribes under Hermann the Cherusker in 9 CE, at the Hermannsdenkmal near Detmold. The central theme of all these monuments is that they celebrate the German nation’s unity, symbolized by the royal and imperial family. National monuments – German statues of liberty? Today, these monuments seem absurdly pompous and conservative, and we usually see them as symbols of the militarism and nationalism that led to World War I. But at the time they were built they were also symbols of hope, progress and modernity. The German middle classes of the 1860-90 era took the initiative for many of these monuments and funded them too. Not out of the kind of patriotism that seems narrow-minded today, but as symbols of a newfound national identity that marked a clear cut with the ancient-regime past. Monument for Hermann the Cherusker, who defeated the Roman legions in the Battle of the Teutoburg Forest in 9 AD. Hermann faces southwest, towards Germany’s “arch enemy” France. Ever since the French revolution and the Napoleonic wars which followed, middle-class Germany had tried to rid itself of its archaic, divided system of government. In 1815, at the Congress of Vienna, and also in the failed revolutions of 1830 and 1848. But each time the various local princes, backed by the aristocracy, had been able to more or less restore the scattered status quo. Therefore, to many ordinary Germans, the proclamation of the Reich and the coronation of the Kaiser at Versailles marked their hope of an end to a period of division, religious intolerance, censorship, and lack of consistent rule of law that had lasted centuries. They were hoping for liberty and democracy. Many people working in Germany’s fast-rising trade and industrial sectors felt that their country had finally caught up with other modern nations such as France and Britain. It’s worth noting however that none of these grand monuments, shown in red, are in the southern regions of Swabia and Bavaria, possibly indicating a lack of fervour for the idea of a united Germany with Prussia at the helm. The 1842 Walhalla in Bavaria, grand as it may be, doesn’t celebrate German unity, but rather the greatness of the German speaking area (including, for convenience’s sake and not to the liking of many Dutchmen, the Netherlands). And another early Bavarian monument, the Befreiungshalle at Kelheim from 1863, celebrates the liberation of German lands from Napoleonic oppression in 1813, but expressly aims to maintain Germany’s federalist status quo (it depicts all 35 members of the German Bund at that time). Bismarck statue (and Victory Column) in Berlin. 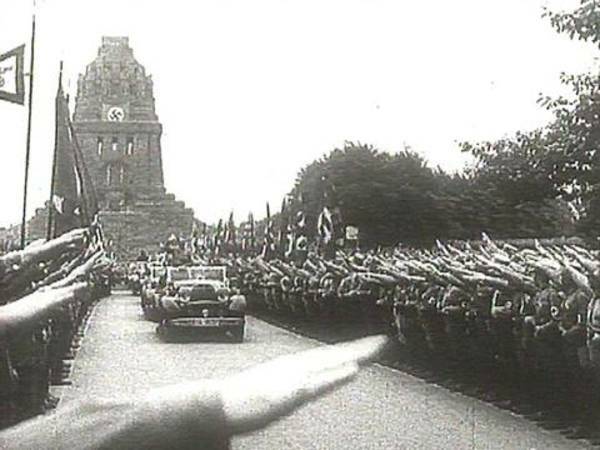 Both were moved from in front of the Reichstag to their current location in 1939. After the death of Wilhelm I, and once the initial wave of monuments in his honour had been built, the monument-building frenzy cooled. His successor, Wilhelm II, was never as popular as the first Kaiser, and in his thirty year reign never inspired the population to keep up the momentum. In fact, monument builders turned to Bismarck as a subject, the original chancellor of united Germany dismissed by Wilhelm in 1890. 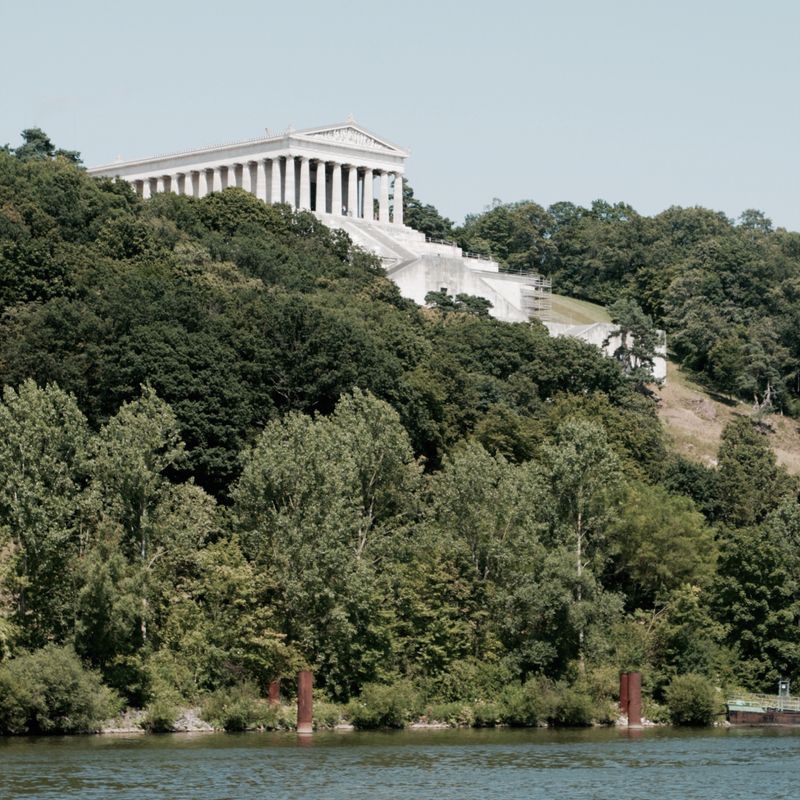 The 1913 Völkerschlachtdenkmal (Memorial to the Battle of the Nations) was built, like the Befreiungshalle above, to remember the 1813 battle between Napoleon’s troops and the Allies on the outskirts of Leipzig. It was the last of the great patriotic monuments built in Germany’s version of the long nineteenth century. From Berlin’s Siegessäule (Victory Column) to Leipzig’s Völkerschlachtdenkmal, these memorials have physically stood the test of time well. Considering all the political and ideological changes since they were built, the remarkable thing is that they have survived at all! Germania is handed the crown. Detail of the mosaic at the foot of Berlin’s Victory Column. Mythical Germania was shown instead of Kaiser Wilhelm I to avoid offending King Ludwig II of Bavaria, who had second thoughts about Wilhelm’s nomination. 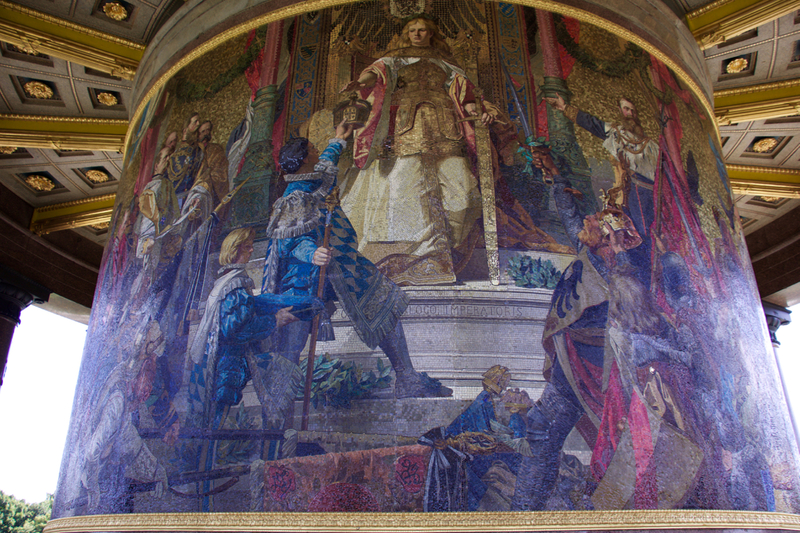 When World War I ended and the Kaiser abdicated, the public’s perception of the memorials, and the political system that produced them, changed considerably. For many Germans, they were embarrassing reminders of the era of the last Hohenzollern Kaiser, Wilhelm II, who, by the end of the Great War, had lost all credibility with the population. But only a few years later, the Nazis were able to seamlessly fit the monuments into their myth of German history. Their often spectacular locations and huge scale made them great venues for Nazi mass meetings. Although many are in more or less remote locations, monument builders took care to make them accessible on day trips for workers from Germany’s emerging industrial cities, sometimes creating a railway station especially for the memorial. For the monuments to carry their nation-building message successfully, it was essential that as many ordinary people as possible would be able to visit them. Souvenirs and miniature monuments were sold at affordable prices, to make sure people would take the message home with them (for a collection of these, see the exhibition at the foot of Berlin’s Victory Column). 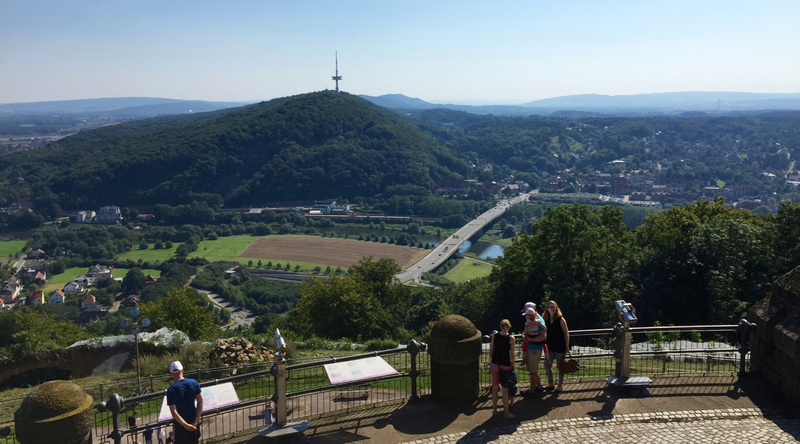 The Kaiser memorial at Porta Westfalica gives a great view of the surrounding hills and forests. At the bank of the river Weser, centre, you can see the railway station built to afford access to the monument. But also after the end of World War II, the monuments remained popular regional day trip destinations for ordinary Germans – just as they were in the era when they were built. Despite the ideological contrasts of both East and West Germany with the monuments’ nationalist and militarist messages, people kept coming to visit, if only to enjoy the view from the scenic vantage points on which they were built. In fact, that is how many of the local Tourist Boards refer to them today. Rather than entangling themselves in the monuments’ murky political history, they simply promote them as viewing platforms. For more information on the historical background of many of the larger monuments and practical information on visiting them, consult the website of Strasse der Monumente – a network of monument owners run by Berlin’s Victory Column.